Your descriptions are dead on! So after using each of the pillows, it seems that I hugely prefer the millet hull pillow and my spouse prefers the woolly bolas pillow. Turns out the wool batting pillow is the only one neither of us preferred. Possibly because we stuffed it fully with all the batting we got. It was too firm. I will experiment with it further, by gradually removing some of the batting to see if it can get more comfortable. The descriptions you have on your site are dead on. I love the millet hull because I can literally punch it and adjust the thickness as I roll around. What is awesome is that it holds its shape until the next punch. My spouse loves the woolly bolas because it is very soft and cuddly even when fully stuffed with the quantity you provided. – G.R. Not one to review items usually, but, it all started with my search for a quality travel sized pillow. Ended up purchasing the inner case, outer case and some shredded latex. The quality of the cases was such that I purchased a full sized case set and placed my favorite fill in it. The new cases made a great pillow even better. In addition, I will not be leaving home without my shredded latex travel pillow. After playing with the size of the pieces and adjusting the amount of fill until I was happy, it turned out to be an extremely comfortable pillow. If you like hugging a pillow when you sleep, shredded latex is the way to go. Your company supplied a quality, made with care, product that I am happy to own and purchase again. Love the product. 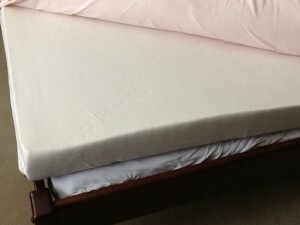 Had a custom mattress cover made that is washable with a cover on top to be removed and washed when necessary. Great product. Washes well. Holds up well. Great sewing for zipper and edges. 🙂 Very happy with the product. – L.
We finally got everything in the mail and put everything together for our beds. Everyone in the house loves them! THANK YOU! THANK YOU! I will definitely recommend you and your business to others. It has been a wonderful experience and we have a great product to last us for many years. I couldn’t be more happy! I was brand new to this style of mattress when I started a few months ago and was reluctant to if I would even like it after seeing it all put together, but I am so happy that I pushed through to the end. I appreciate all your help! – M.R. So I just wanted to tell you that I’m SO HAPPY that we decided to buy the latex for our bed too!! We stole the kids’ beds last night (they came yesterday) to test it out and I haven’t slept this good in a long time!! I’m super excited to get ours now! LOL. Now I just have to find somewhere to store all them during the day… I have no idea what we’ll do, but it’ll be so worth it! (We are a family of 5 and live in 800sf, and so we sleep on a foldout couch, and the kids had mats on the floor that can be folded up, and all of it gets put away during the day). – M. P.
I wanted to thank you for the fantastic crib mattress and puddle pad – we’re very impressed with the quality, information, and friendly service. My husband and I were in desperate need of a new bed. I heard of DIY Natural Bedding from my sister who lives in Indiana. We do not however live in Indiana and could not go try out the mattresses our selves. We felt worried about buying online without actually trying the product out! Deborah gave us all the information we needed to go to a local store and try out similar mattresses. She was very knowledgable and gave us peace of mind during that process. We told her which 3 layers we preferred and ordered them right away! They were delivered promptly as stated in our ordering process. It was super easy to put them together and zip up the cover. We didn’t want to get out of bed that night or the next morning! We highly recommend going through DIY Natural Bedding! I wanted to let you know that we received the wool topper and my wife and I refused to get out of bed yesterday! Thanks so much! We actually slept till noon. Then she took a nap (I couldn’t because of parenting obligations) and then we were both back in it by 9 PM! Our bed is fit for a king, thanks to Deborah and her team! We ordered a medium firm latex slab with wool and cover from Deborah. The mattress has made our bed very comfortable again. For those who are interested to know, the latex sits between a 3″ thick cotton mattress and a 5-6″ wool topper, which after 3 years of compression had become hard (see the first photo). Before I ordered, I was most concerned how to get the firmness right. I called Deborah, told her our body weights and heights and the problem of our bed, she correctly suggested the medium firmness. But when the slab arrived, because I was too used to our hard bed, I panicked and reordered a firm slab, using Deborah’s “buy and try” program. It took some time for the replacement to arrive, by then I had already got used to the medium slab and realized my mistake. The firm slab proved to be too firm indeed. 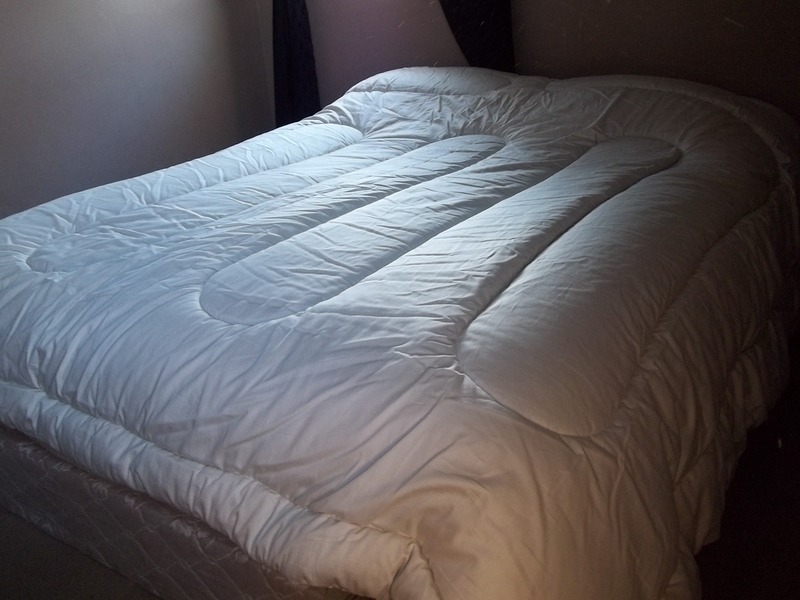 When I zipped up the mattress cover at last, I had one more amazement to tell: the cover looks very simple, but I would not try to make it myself because Deborah’s seamstress has made it fit to perfection. The cover is not one bit smaller or bigger than the latex, so that it feels completely smooth (See the second photo). During the whole process, I have learned not only to trust Deborah’s professional experience and judgment but also to highly respect the quality of her work and the reliability of her service. When I became really hesitant and frustrated, she was consistently patient and nice. I know on-line shopping for a mattress sounds hard, but my experience has taught me that it really depends upon whom you are dealing with. Now I know our body takes time to tell which firmness is right, I begin to doubt going to the store in person to try mattresses is an easier way. Overall I am quite happy with this shopping experience at Deborah’s site. The millet hull pillow is quite comfortable. I haven’t adjusted the fill yet, because I wanted to see how it breaks in over a couple weeks. I might take a little out so I can create more of a “valley,” but for now it’s working and I’m quite happy with it. 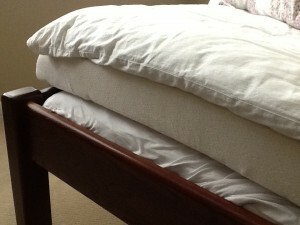 On my journey to do a DIY all natural bed I came across DIY Natural Bedding. I called up to ask some questions, and I was delighted that I found someone on the other end of the phone who cared about and could understand what I needed. The kindness and intelligence of the customer service is outstanding (as others have said: it’s true they do research your needs and questions if they don’t have immediate answers!). The quality of what I ordered is off the charts. The prices are cheaper than just about anyone’s anywhere else. The shipping was done in a timely manner; everything was properly packed to protect against the elements and bugs, which is more than I can say for a lot of other all natural bedding companies. Thanks to DIY I have a fantastic 1/2 queen day bed made up of two 100% natural 1/2 queen dunlop latex toppers — one 3″ soft and one 3″ extra soft — with an organic 100% cotton encasement and luxurious 1/2 queen organic wool puddle pad (yes, it’s luxurious). They also made the ticking and wool puddle pad for my night bed. I also want to make dust mites covers because someone in the house has a terrible allergy. Thanks to DIY’s help and perhaps above all patience as well as a good bit of inspiration, I am on my way to making them myself using the ticking pattern they sell and their zippers (I found the cloth elsewhere. But they even helped me in the search to find the proper cloth). I am making it myself for less half the price of any dust mite cover on the internet of the same quality (it’s very hard to find and quite expensive to buy a dust mite mattress encasement that opens like a book). I am very happy with my purchase as well as experience working with them. As a new mom learning about all the terrible toxins in mattresses, I searched everywhere for a non-toxic alternative. It seemed impossible to find a mattress that wasn’t outrageously expensive and didn’t have some sort of flame retardants or springs that attract EMF’s. 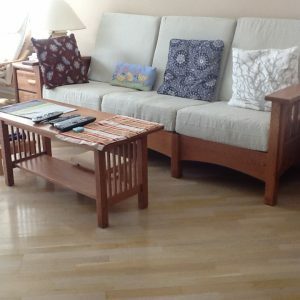 When I stumbled across DIYbedding.com, I was amazed!! Building our own custom mattress was so perfect for my husband and I because we like to have a lot of room when we sleep and we were co-sleeping with our 6 month old. Deborah was so helpful while we made our decision about size, thickness, and material. We were able to order a custom bed that is bigger than a king! We absolutely LOVE it! The latex is so supportive, we only needed the 6 inch height! We HIGHLY recommend DIY Bedding to ALL of our friends who are health conscious! We couldn’t be happier with our purchase! 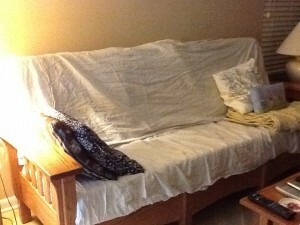 We are thrilled with the GOLS organic latex foam that you provided for our sofa reupholstering. It is the most comfortable sofa in the world and hands down the best place ever to take a nap. It was significantly less expensive for us to have our Baker sofa upholstered with your organic latex and organic cotton batting than to purchase a new latex sofa. It’s very hard to find a supplier of GOLS upholstery foam. We are so glad to have found you and know where we will go for our next bed and future upholstery projects. I just wanted to say how much we love our latex bed and pillows! We wanted a comfortable, chemical free bed and that’s exactly what we got. Not only that, but we were able to put together a bed and have a removable topper that we can use in our 5th wheel so we can take our comfort on the road! I can’t wait to replace our kids’ beds, and we will definitely be replacing them with latex beds and pillows from DIY Natural Bedding!! I’m happy to say we LOOOOOOOOOOVE our new mattress :D. The last piece of latex made it just perfect, it’s not as soft as our tempur-pedic type but it’s way nicer in my opinion and the most important thing is that when my baby crawls over from his co-sleeper he can snuggle next to me without sinking unsafely into the mattress or breathing the nasty fumes!!! Funny story, we found the mattress noticeably softer without the wool puddle pad so we took it off and are going to use it as a rug underlayment for his rug, since we needed a non-toxic wool one anyway!!! We got the bed together and my son is enjoying his new bed!! The hardest part about how much my son likes his bed is getting him up in the morning 🙂 Just wait until he gets a wool comforter next winter…..it will be worse. He’ll just want to stay in bed. I am so happy that we found your website back when we got our bed. We are all enjoying a healthy night’s sleep. – S. T.